Click the button below to add the The Barber of Seville (Overture) by Rossini/Babak to your wish list. Description: This is a transcription for Guitar Quartet of the entire Overture to the opera buffa in two acts by Gioachino Rossini's - The Barber of Seville. The main sources used for this arrangement were the orchestral version and also Mauro Giuliani's version for two guitars. 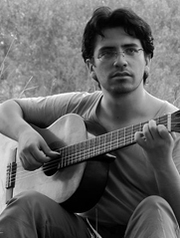 In some sections guitaristic effects such as rasquados and suggested fingerings were added. Perfect and fascinating! Hope to see more of your compositions and arrangements. fortunaely i have had the chance to hear this arrangement palyed by the Cedar guitar quartet itself. really an amazing arrengement. It seems a nice transcription! It's a great pleasure to see it's published. Thanks to Babak and Secondaprattica.